Horse Whispering is a method of communication based on techniques derived from observation of free-roaming horses, and rejecting abusive training methods. 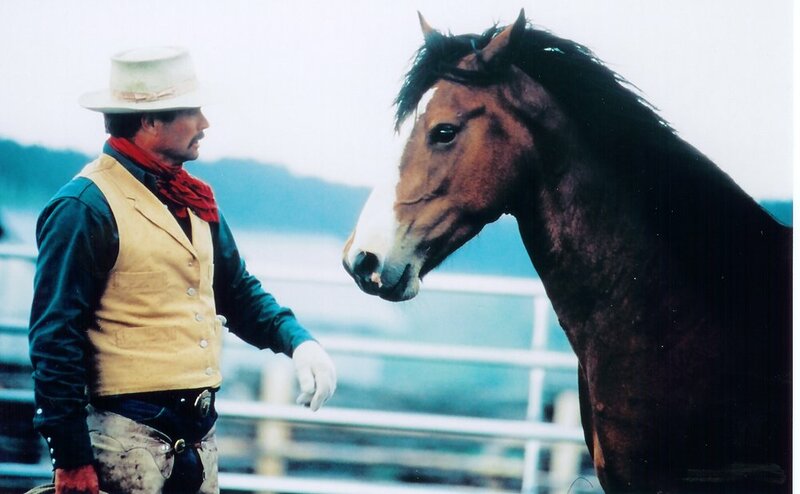 During a typical one-hour demonstration, Grant works with a troubled horse in front of the audience, explaining the principles he is using to build confidence in the horse. We own and maintain a herd of well trained horses on the ranch. The troubled horses used in demonstrations are typically owned by third-parties that come from all over the country seeking Grant’s help. The transformation seen is nothing short of amazing—and, as remarkable, is the change that takes place in members of the audience. Grant’s work with the horse provides a framework to help individuals better understand their own challenges and to unlock their own vast untapped potential. Afterwards, Grant will answer questions as guests enjoy western cooking, live music and the breathtaking views of the Grand Tetons. Business leadership from Microsoft, Alibaba, General Electric, Toyota, Disney and countless other Fortune 500 companies have traveled thousands of miles to the Diamond Cross Ranch to watch Grant Golliher break through to troubled horses. Horse whispering teaches leadership skills, communication, and trust. It reveals truths about the natural world that can be applied to business, self-improvement and relationships. Grant Golliher has dedicated his life to working with troubled horses. His lessons from the corral navigate fear and motivation and reach past self-improvement fads to reveal time-tested truths. The lessons are as fundamental and ageless as the relationship between the horses, the men that ride them and the rugged beauty of the West. Horse Whispering teaches one how to build trust, to lead effectively, and to inspire confidence in others. And the best part is you don’t need to actually work with a horse to achieve the transformation. Simply witnessing what is possible can open your eyes to a far deeper level of understanding and effectiveness. By applying the lessons we teach, you can dramatically change yourself and those around you for the better. We’ve seen it in the countless visitors to our ranch. And no matter where you start – if you’re broken and need healing, or the world’s richest men or women - these lessons unlock a higher agency. Come experience it for yourself and see what many of the best and brightest in business already know. Grant frequently travels throughout the country to share the lessons of Horse Whispering. Please contact us for more information on booking him for an outside event.